The time span goes from the Fanfares nouvelles by Marquis de Dampierre from the mid-eightennth century all the way to composers active today such as Heinrich, Paccard or Comte. 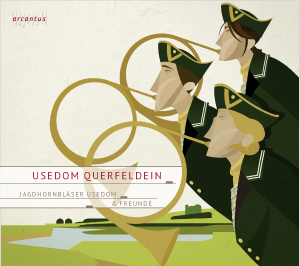 Vivid lage-scale fantaisies stand alongside not only extracts from operas but also Des Jägers Wanderliedchen by Wunderer and the arrangement of the folk song Kein schöner Land. The varied and colourful overview of hunting music on the disc is completed by hunting fanfares and for small ensemble and by extracts from instrumental Masses.